The end of July is etched in the minds of every Coldharbour Citizen, as they unite annually to celebrate Markus Schulz and Coldharbour Recordings’ storied journey in grand fashion. And on the day the label celebrates its 10th anniversary, we at Coldharbour are very proud to showcase some of the world’s most talented producers to the world on such a regular basis. As a special thank you to the fans, Markus unites once again with GDJB broadcast partner and our close friends at Afterhours.fm, to bring you an enormous radio marathon on Monday July 28th – 36 hours of sets from 30 members of the Coldharbour family – including a special exclusive 5 hour set from the master himself. Coldharbour invite you to join in the celebrations, as they reflect on the best moments throughout the label’s history, enjoying the current summer offerings, and glimpsing into what the future has in store. 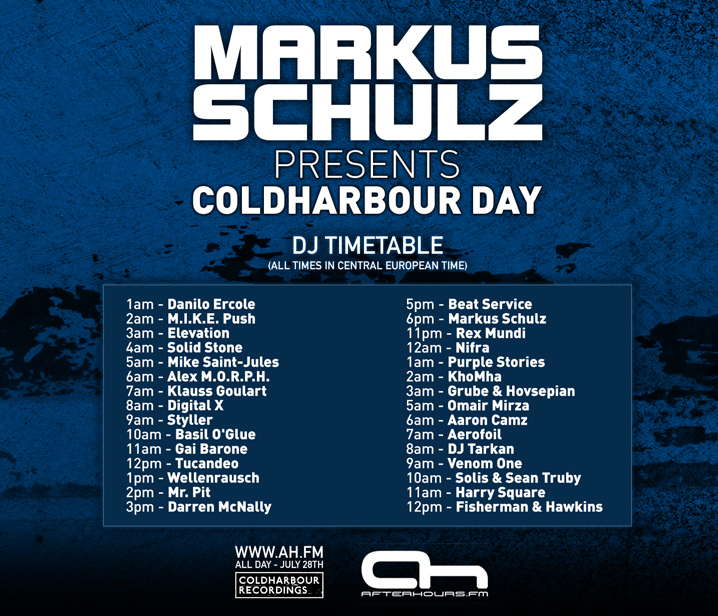 Coldharbour Day – a celebration for the DJs, for the producers, and most importantly of all, for the fans.